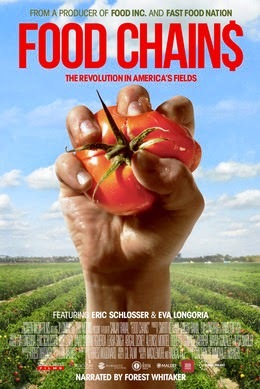 Last Friday, I saw the Los Angeles premiere of Food Chains, a documentary film about the revolution in America's fields. This film focuses on Florida's hardworking tomato pickers who pick and pull thousands of pounds of tomatoes each day, providing the foundation of the fresh food industry. The film exposes the human cost of our food supply from the fields of workers making improper wages to the big supermarket chains making trillions without protecting their foundation's wages or safety. The subhuman conditions are explored along with the Fair Food Program, which was developed by the Coalition of Immokalee Workers (CIW) to partner with growers and retailers to improve working conditions for just one penny per pound. In 2011, the Fair Food Program was launched with a number of stipulations including: educational sessions for workers held on the farms and on-the-clock, auditing by third-party monitors to ensure compliance, and payment of a small Fair Food premium which is passed on to tomato growers. Food Chains follows a collection of CIW volunteers and supporters as they work to increase consciousness and commitment of people to produce change. CIW is an internationally-acclaimed, worker-based human rights organization that promotes social responsibility while helping to decrease human trafficking and violence. They are a leader in the growing movement to eliminate modern-day slavery and labor abuses. I was lucky to listen to a Q&A session from two CIW members after the film, who shared their perspective of the fight for fair food from the last 20 years and their hopes for human rights moving forward. I was so moved by Elena and Lupe's words of hope and ambition for the future of farmworkers; they were never discouraged by the bumps in the road they described but only more motivated to fight for equality. Click here to find a screening in your town or buy it on iTunes. Then, take action and pledge to support fair food.